Winter came in with a bang. Will it go out with a whimper? Energy rates escalated quickly, without warning in late 2018. This was caused by sudden cold weather. However, they have since reversed, having come down significantly in the last month. Why? We’ve had more moderate winter temperatures. The variable-price natural gas rate for February in NYC, which once traded as high as $.70/therm, now appears to be a more moderate $.55/therm. Nearly all pricing options should result in favorable rates, near or below those from 2018. We can help you evaluate your risk and make a decision that is right for your organization. The cause of the very volatile November and December was the low amount of natural gas in supply. A refresher: the U.S. maintains storage of gas to ensures we have enough for winter heating. While moderate temperatures have helped prices come down in the last month, the underlying supply deficit continues–for now. Our projection: volatility in the first 3-6 months of 2019, and then stability after that. The natural gas storage deficit is projected to dissipate later in 2019, which should lead to longer-term favorable market conditions and prices. We recommend taking a look now at all energy contracts that expire before July 2019. Our energy markets experts are here to help and provide clear recommendations. 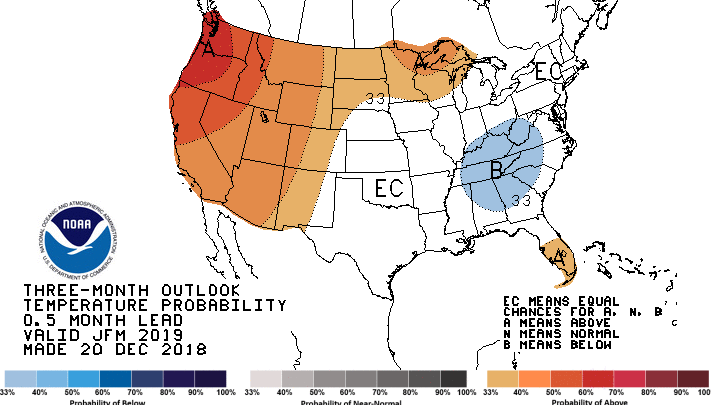 This winter is forecasted to have usual winter conditions in the Northeast, and slightly warmer than usual in the West. The orange/red in the maps below indicate heat increases from normal. 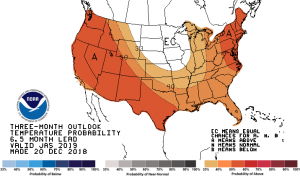 A mild winter that doesn’t require much heating in the Northeast would improve gas storage conditions and bring down prices. An average cold East Coast and Plains winter would reduce stored gas levels further and raise prices through all of 2019. 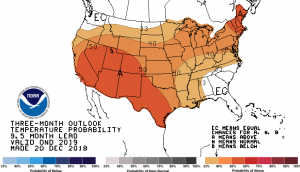 Summer temperatures are projected to be above normal, which would cause an increased demand for electric, and add market volatility.